Mountain Weather: Northwesterly Flow or a "Dirty Ridge"
Northwesterly Flow or a "Dirty Ridge"
Surprisingly, we have managed to pick up roughly 20 inches of new snow in the Teton Mountains since Valentine's Day (Totals for Feb. 13 thru 19) with weak Low pressure systems wandering around the Western U.S.
That jet stream will be positioned just to the north of Jackson Hole, so we will start out initially with warmer air Tues. into Wed. Then, that jet drops further south Wed. night & Thurs. bringing colder air with it. A Ridge of High pressure will be positioned off the West Coast and moisture associated with Low pressure systems in the Gulf of Alaska and further out in the Pacific will be directed up and over the top of that Ridge and straight over us in a consistent NW flow aloft. This is not a “storm” per say, but rather a very moist and consistent Northwesterly flow, which is usually a very favorable flow to have for producing decent snowfall in the Tetons. You might also call this a “Dirty Ridge” situation, where moisture rides over the top (northern part) of a Ridge of High pressure that is usually located along or just off the West Coast. 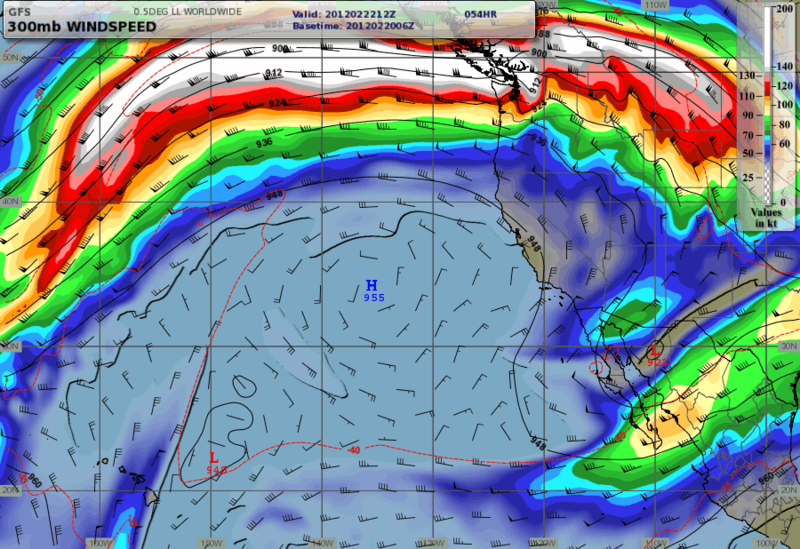 Snowfall will follow the trail of moisture, and generally will be in the vicinity of the jet stream flow, as well. Maps below of Forecasted Snowfall for Western U.S.
Looks like the best snowfall for us will come Tuesday afternoon thru Wednesday afternoon, with very strong winds developing, especially in the mountains. 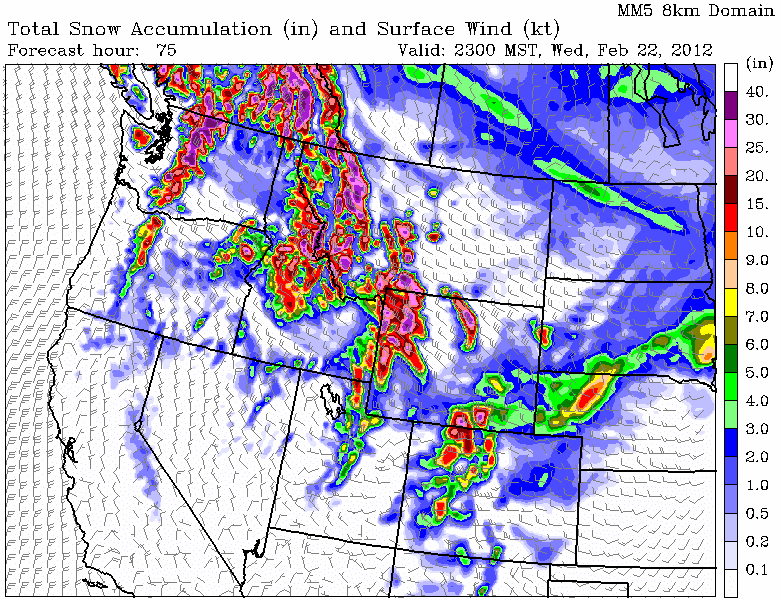 This model above shows something in excess of 25 inches of snow at the higher elevations in the Tetons thru Wednesday evening. More conservatively, I think you can count on snow accumulations in the mountains of between 1 and 2 feet. Snow tapers off for Thursday, then we see a Low pressure system drop south out of B.C. at the end of the week, which will bring more snow to NW Wyoming Friday and over the weekend.